Singapore is one city that does not have shortage of upscale properties. Be it the 5-star category, or the rising popularity of boutique luxury hotels–the dilemma will always be choosing among the myriad of choices. Now when it comes to luxury brands, many do live up to their names, but only a select few exceed the expectation behind the brand name. 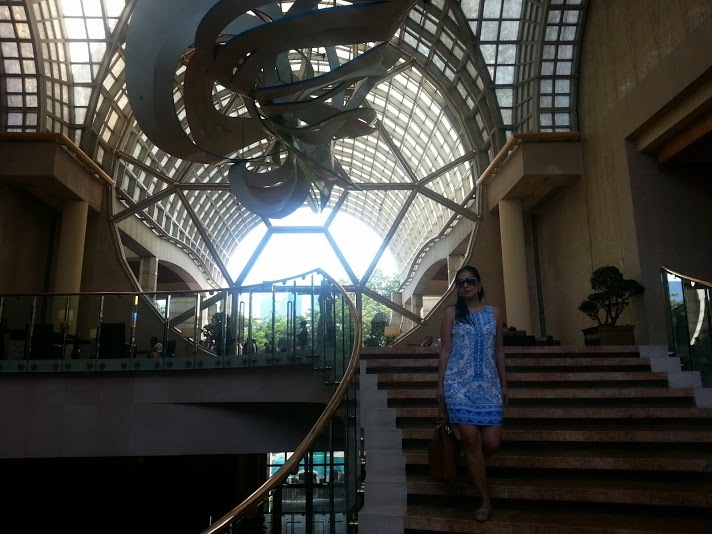 On my recent layover in Singapore, I was delighted to find out that the Ritz-Carlton Millenia is one property that certainly lives up to and exceeds such expectations from a Ritz-Carlton brand. Nothing short of splendid. Our flight from Sydney was delayed by 40 minutes, and our pick-up was aware of this, so he wasn’t waiting for ages (whew!). 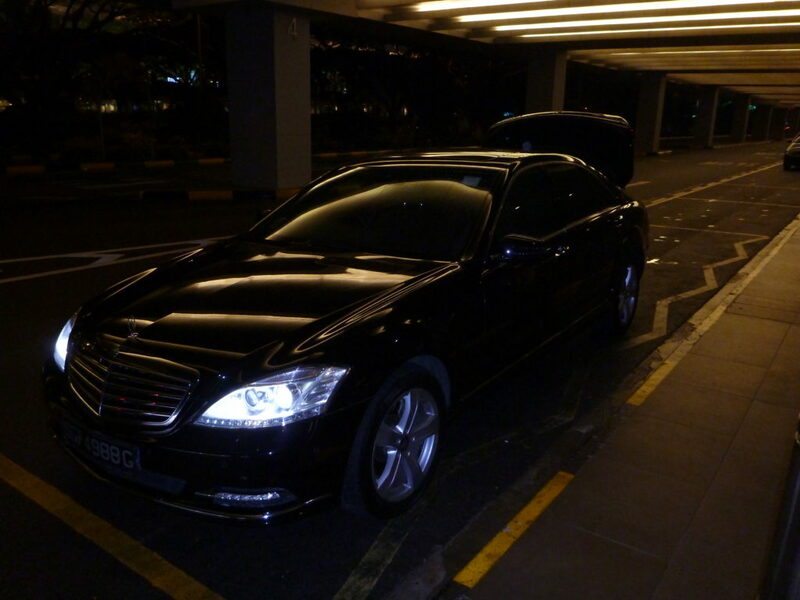 A sleek Benz was our ride from the airport to the hotel. wi-fi ready with drinks and towels too! 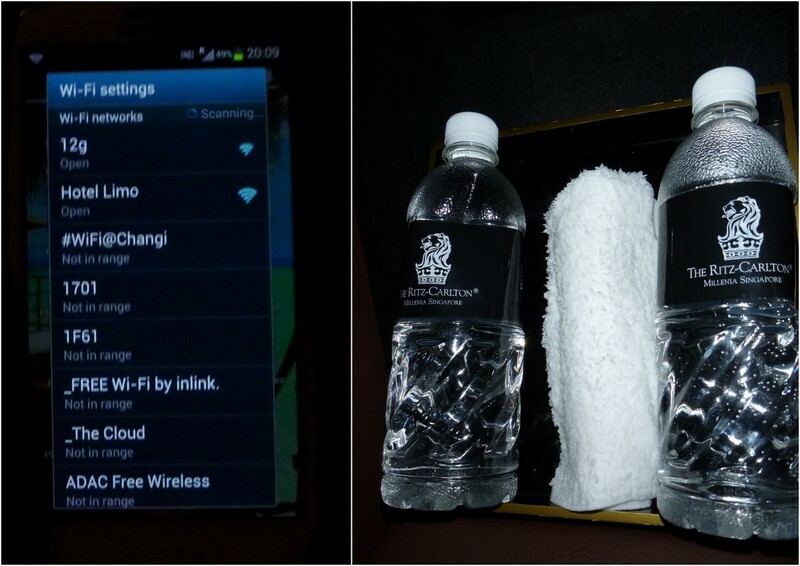 The limo had Wi-fi on board and also cold towels and water ready. As soon as the limo stopped in front of the hotel, a staff member from the Club Level greeted us and escorted us to our room immediately. I never even saw the reception desk as this was done so smoothly. All the document formalities were done right inside our room. For corporate guests, or those who just need work to be done while at the hotel, I’m pleased to say that the room does not run out ever of power plugs (and they come in a universal plug too!). The working desk above was filled with plugs, and also on either sides of the bed, 2 plugs each. Not to mention the random nooks and corners that have them (to charge phones and cameras). How very thoughtful, and for those of us who work while travelling, very necessary. The Club Premier Suite is way more than generous in space, 549 square feet. The King-sized bed was beyond comfortable with soft yet robust pillows. Just the right combination why I slept uninterrupted for several hours that night, which is a rarity for me. 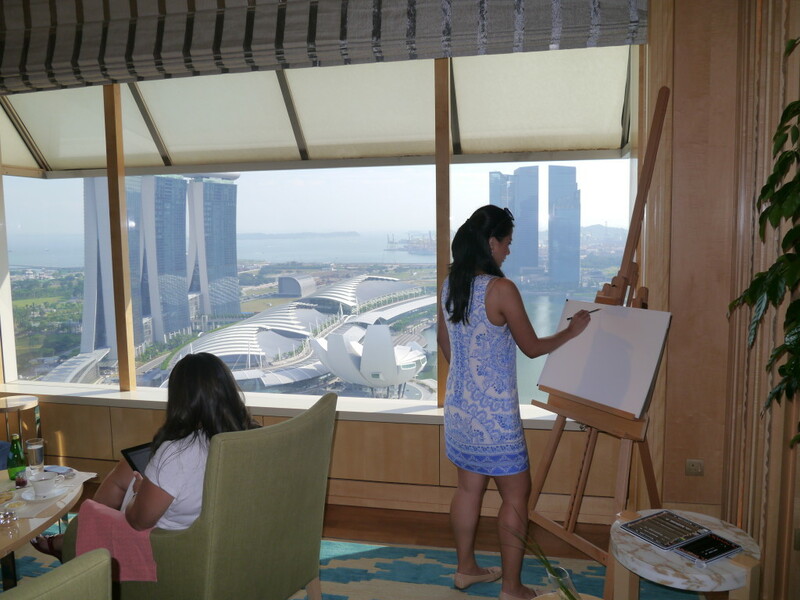 Now the views from the Club Premier Suite (Marina Bay view) is just spectacular. 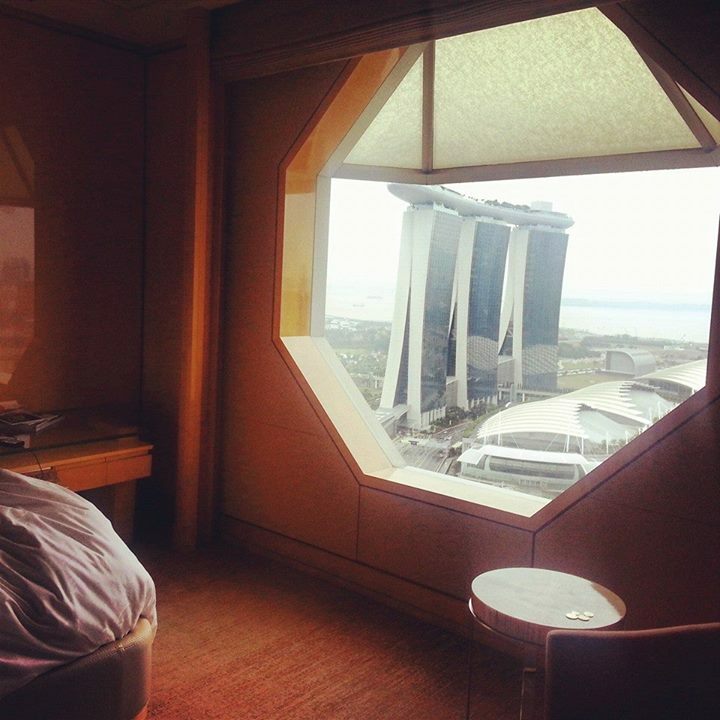 You can view all iconic structures of Singapore in one window. 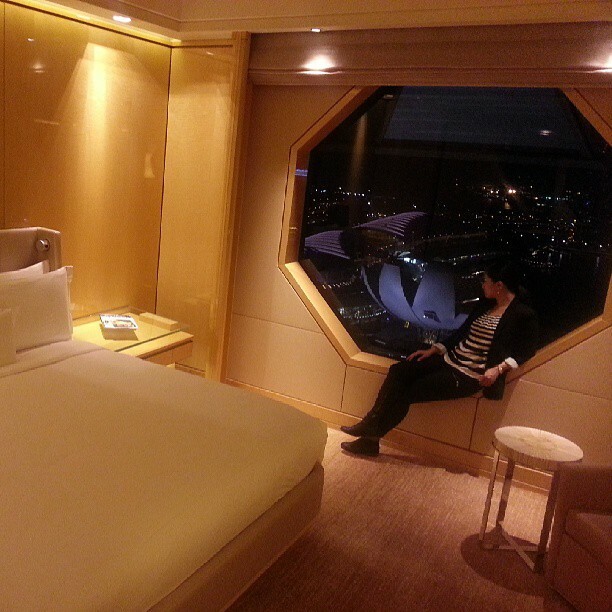 That octagon window frame is part of the reason why the view is just wonderful. 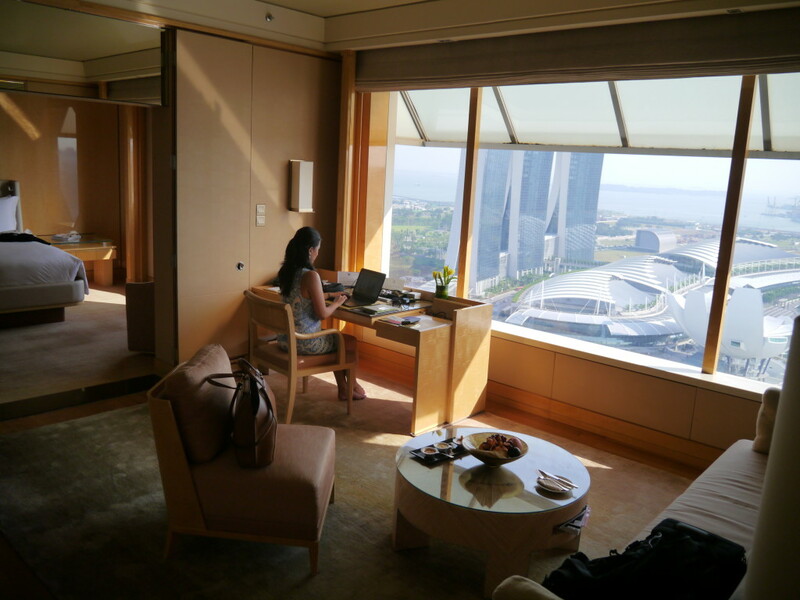 This is what I love about the Club Premier Suite of the Ritz-Carlton Millenia Singapore. While other hotels may boast of a grand structure/facade from the outside, the majestic allure of the Ritz-Carlton Millenia is felt from the inside, as a staying guest. And this to me, makes it an even more precious and exclusive experience. Now we all love spacious and functional bathrooms right? 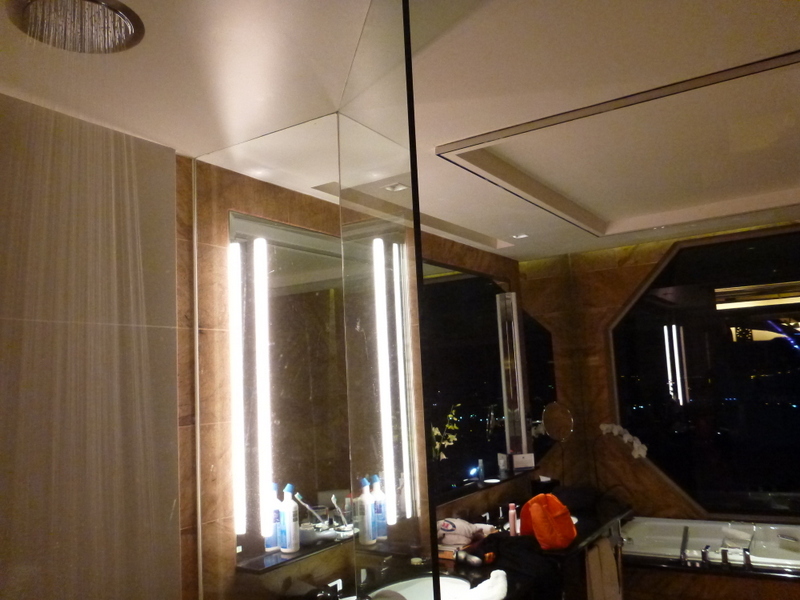 But one with a killer-view will ensure you that baths and rituals will be taken longer than usual. 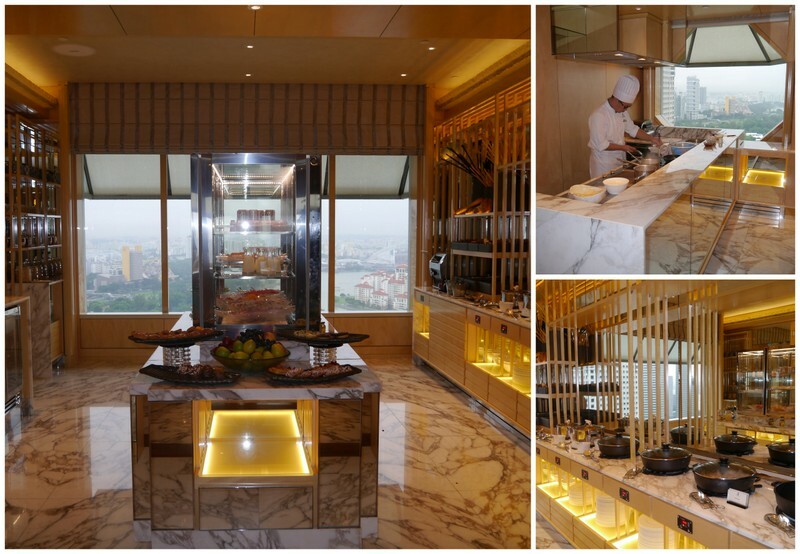 Breakfast (and all other meals) are served at the newly-renovated Club Lounge of the Ritz-Carlton Millenia. It is an intimate setting exclusive for Club Lounge guests and members, which means you have more privacy and quiet. 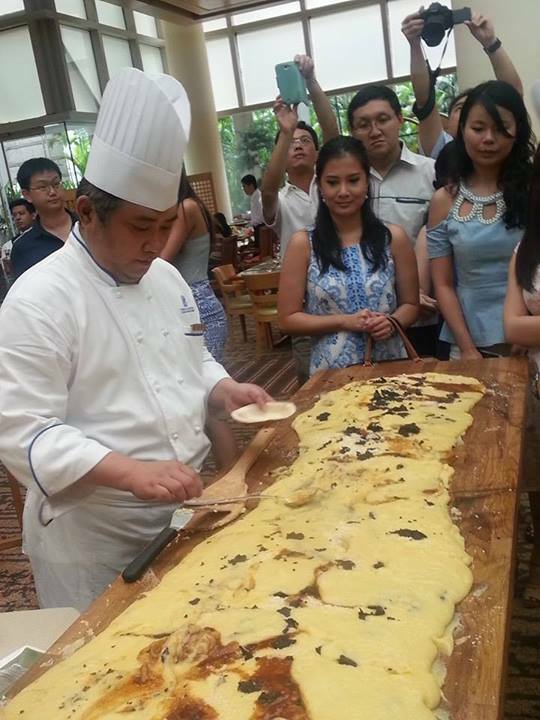 A very wide range of Asian and Continental breakfast is on hand, with omelettes and (and other requests not readily found in the buffet,) on demand. Brunch has never been so festive! 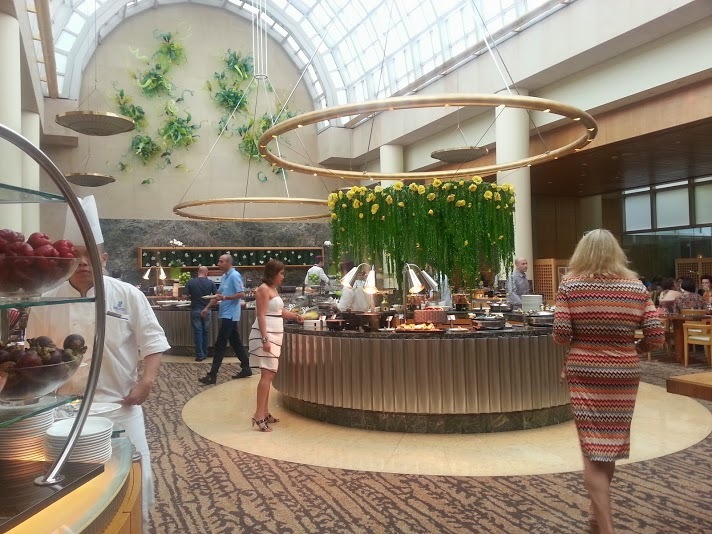 A Vintage Brunch from 12pm to 3:30 pm is held every Sunday at the Greenhouse on the ground level of the Ritz-Carlton Millenia. Offering an unlimited flow of Moet and Chandon, freshly shucked oysters, seafood and roasts, the Vintage Brunch is a perfect way to spend a long extended lunch with friends and family. guests (including yours truly) waiting to be served the creamy rich Polenta with truffles. Yum! The chefs worked quickly and in time to live classical music played by a quartet. 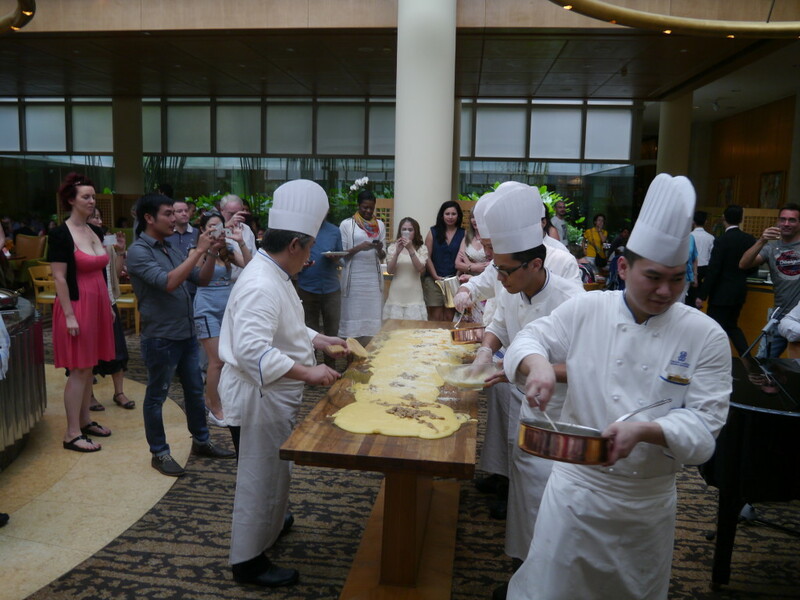 It was so entertaining and mesmerizing to watch them work the creamy polenta and add truffle to it. Well it wasn’t just the showmanship that was amazing, but the polenta and truffle itself too. 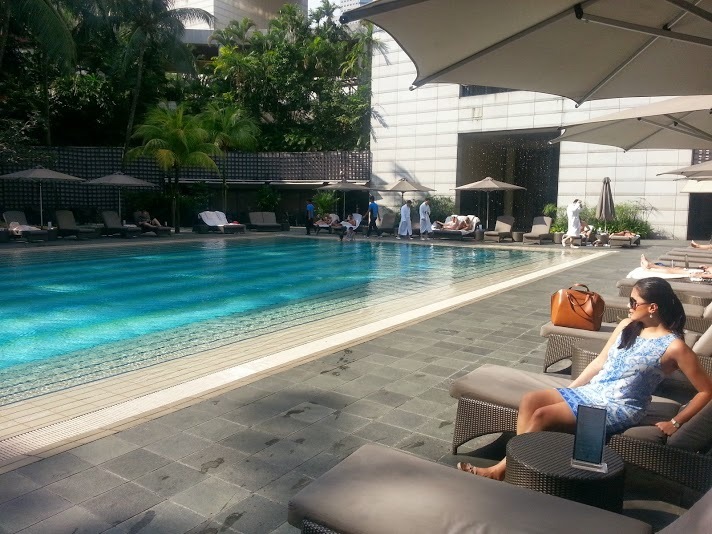 The Ritz-Carlton Millenia Singapore offers a decent-sized lap pool for adults and a smaller one for children. Having had a quick stroll of the hotel grounds, I can say that my favorite feature of this property is still the magnificent ROOMS. I didn’t want to leave the room, and that’s a very good indicator of how fantastic they are. 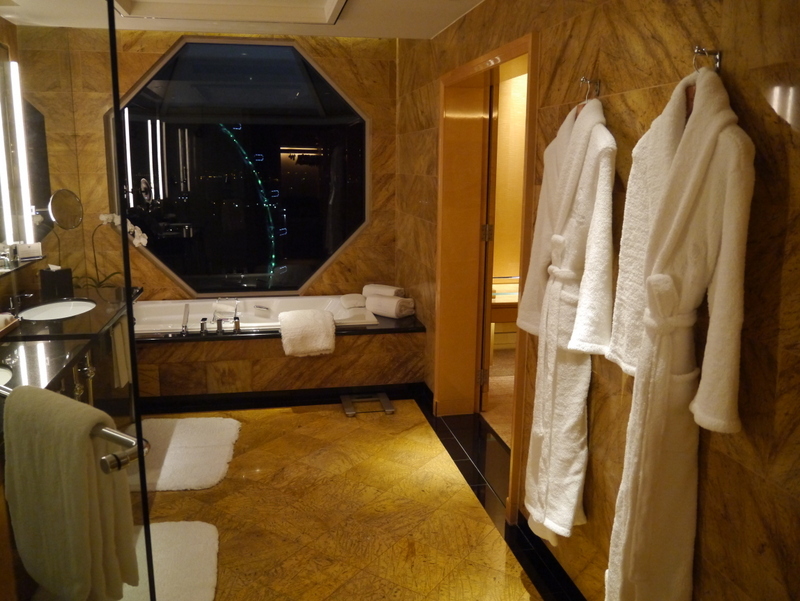 There are very few luxury hotel brands whose service and product meet and surpass the expectation. Both the Club Level room and the customer service of the Ritz-Carlton Millenia are incomparable. It’s an experience that once felt, you wouldn’t want to settle for anything falling short, especially on the customer service aspect. 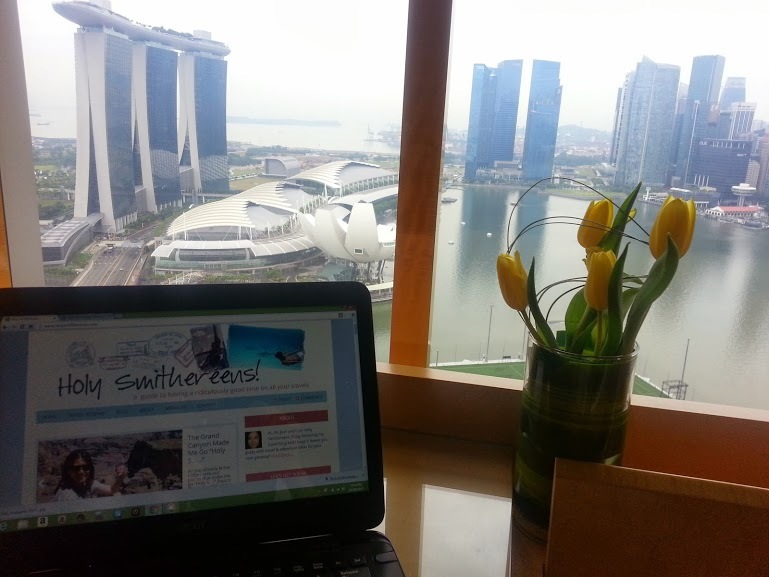 To book your stay at the Ritz-Carlton Millenia Singapore, please click HERE.